Would you like a little culture with that? The day has dawned. 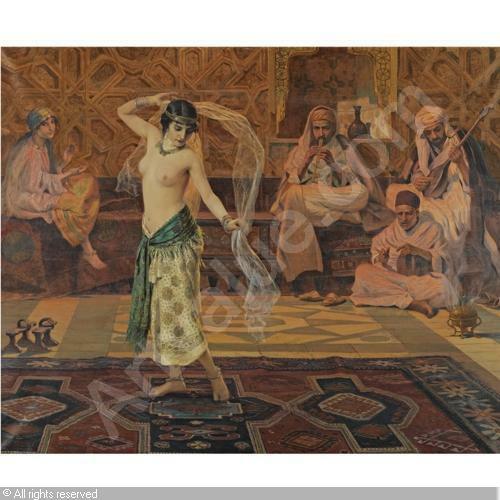 Minister for the Arts, Simon Crean, will unveil the Labor government’s National Cultural Policy at the National Press Club today (I’m hoping he teases us, and reveals the details slowly… enticingly… think ‘Dance of the Seven Veils’). We haven’t had one of these since Paul Keating’s much-vaunted ‘Creative Nation’ in 1994 – a cultural policy that (ominously for the current government) didn’t survive Keating’s ignominious ousting in 1996. In the lead-up to the release, Mr Crean has trotted out those well-worn public service buzzwords: ‘consultation’, ‘stakeholders’, and ‘arts constituency’. Do you think they’ll manage to squeeze a ‘paradigm’ and a ‘benchmark’ or two in there? One thing’s for sure – given the government’s obsession with holding onto a surplus in the upcoming budget, any spending they plan to do on the arts will certainly have to be smart. And creative. If you can’t wait, or can’t be bothered trying to find the journalistic wash-up in tomorrow’s papers, the launch is to be televised and can be viewed live from 12.30pm (EST) today… link here. What makes us human? We do something like this just for the sake of it, and love it… just because. 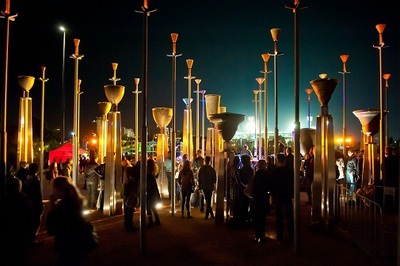 Last night, 300,000 Melburnians flooded into the CBD and embraced the inaugural ‘White Night’ arts festival. I’m a rusted-on cynic. It’s rare for me to experience a flush of unconditional pride in my city and the people who live in it. But, today? Yeah. I love every last, crazy, one of you. Bring on White Night 2014. Rudd-y Hell! Might be time to change your link headers, Labor. OK – not arts related. Although in my defence, I did find this whilst in search of arts things. Googling away, looking for the ALP’s arts policy, this popped up in the search engine. 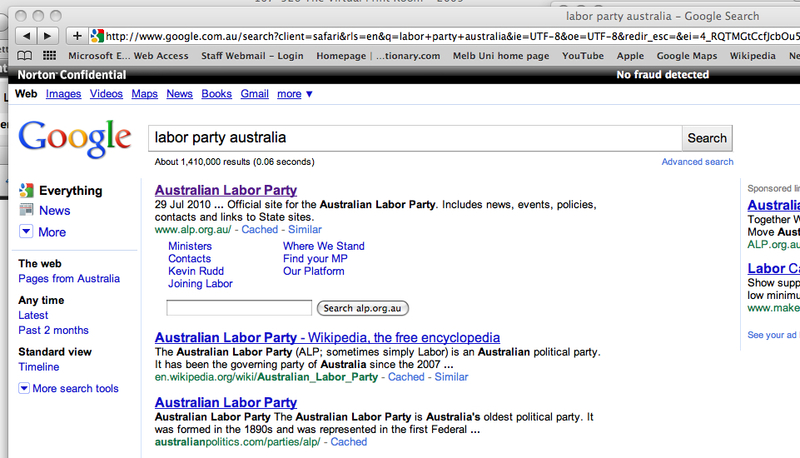 Madam Prime Minister – I know you must be frantically busy, but you may want to update the ALP website links. Is it right to copy? Visual artists and copyright. I’m not going to go over the well-trodden ground that is the appropriation debate, covered here and here. But I am going to throw this one into the ring… After the on-air discussion at the ABC earlier in the week, I asked Sam Leach a question that has been puzzling me for some time: what his response would be if an artist whose work he did not particularly admire – for argument’s sake I used Ken Done as an example – appropriated one of his works of art, altered it slightly and signed it, presented it as his own, then started selling postcards and t-shirts down at the Rocks in Sydney embellished with said image. I won’t influence your thinking on this conundrum by repeating Sam’s very reasonable response. But the subtext to the question is – are the laws of copyright in the visual arts set to one side in instances where the appropriator is an artist whose work the progenitor of the image admires? If we’re to look at the cold, hard legal facts of the matter, the appropriated artist’s copyright is infringed where substantial portions of their work are reproduced by another artist without their prior consent. But it is up to the artist to enforce their rights – if they approve of the outcome of the appropriation, they’re hardly going to prosecute the artist who has referenced their work. But what if the maker of the original image is unhappy with the altered image? Or does not approve of the way the image is being presented or sold? Appropriation and the use and alteration of imagery that, according to strict legal precedent, can be subject to copyright laws is a central tenet of many contemporary artists’ work both in Australia and internationally. But the practice is characterised by many and varied shades of grey. Should the question of whether or not the matter is prosecuted depend upon the artist’s discretion, or should there be a more objective set of standards and procedures in place? The debate has been well and truly sorted out in other arts sectors. The case in music is clear-cut – just ask Men At Work, who are no doubt cursing that now infamous flute riff in ‘Land Downunder’ (can the flute riff? Hmm). As it is in theatre and dance – if you stage a performance, the creator will be given due recognition, even where the director and cast may have dramatically reinterpreted the author’s original production. In that instance, all contributors to the production will be given due credit. But it will be promoted as “so-and-so’s production of such-and-such’s ‘thingumy-jig'”. In the visual arts it has, to date, mostly been an ad hoc approach based on artists willingly waiving their rights to accommodate the practice of appropriation. But it is interesting to consider what would happen in a case such as the example given above.